So you've read a snippet about each team, now let's get down to the overall thoughts on this year's district tournament and the matchups for round one. Once more, here's the tournament bracket full of dates and times. 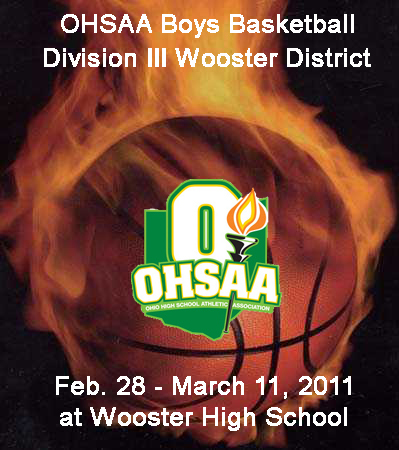 It is going to be another exciting series of games in the DIII Wooster District Tournament at Wooster High School. The parity and competitiveness in the district are pretty high this year, in my opinion, which should make for plenty of intriguing matchups and thrilling finishes. However, there are very, very few marquee or dominant teams that could make a threat anywhere outside of the district. So this year the tournament could either be very exciting or very boring – it just depends on what you want. If you are a person that goes to basketball games in hopes of seeing top-tier talent, competitive, state-ranked teams, and some foresight to the future rounds of the tournament, the 2011 version of the DIII Wooster District Tournament is not for you. But if you want to watch country boys get after it and play the game “the right way”, as well as experience the intensity of some of the backyard rivalries this tournament could provide, then you could very well enjoy what will be going on in Wooster High School. So, what are the specifics? Favorites: There is one and only one clear-cut favorite in my opinion – the Hillsdale Falcons. They are 15-2 with losses to preseason co-favorite Dalton by 3 and at co-WCAL leader Northwestern by 10. They are led by a duo of frontcourt players who are not only big but run the floor and do all the little things for the Falcons. Surrounding them are several key role players who all seem to be disciplined and get the job done. They are my pick to win the district. This should come as no surprise. After Hillsdale, there is only one other team with less than 6 losses – the Northwestern Huskies. They may have the best player in the tournament in sharp-shooter Brennan McKean; however, the Huskies potentially have a 2nd round game against Triway, which beat them by 8 on their home court in the season opener. A few teams come to mind right away when I think of the teams with sub-par records who I think could cause fits for the statistical “favorites” in the district. 1) Norwayne – Their two losses to Hillsdale were by a combined 5 points. They lost to DIII state-ranked Manchester only by 4. Their latest loss to Northwestern was by 4, as well. Add to that their 2 wins over Dalton, and they can cause any team problems on any given night. 2) Orrville – Yes, they’re the #4 seed. As I mentioned earlier, though, the Red Riders faced probably the toughest schedule of any team in the tournament. Their big man Zach Wasson returns from last year but has had a younger supporting cast around him than what he’s used to, I think. The Red Riders’ depth has been an issue, in my opinion, but seems to be getting more in tune with expectations over in the sports town. Nobody, except for maybe Hillsdale who controlled their game against Orrville earlier in the season on a neutral court, will want to play Orrville – very dangerous! 3) Triway – Playing a disciplined team like CVCA, state-ranked Manchester, and DI Timken all twice in PAC-7 play along with Wooster, Northewstern, and Hiland in their non-conference games, the Titans have definitely played a very tough schedule, as well. Like the other upset alert teams, Triway might not have many wins, but historically they have been a team to play their best basketball of the season at tournament time. I can’t imagine this year being any different. I'm of similar opinion as that of Andrew. This seems like a pretty cut-and-dry tournament. Northwestern and Hillsdale are clearly the two best teams in the district, and they've pretty much proven that during the regular season. I think there will be some mild upsets, and a lot of close, low-scoring games, but in the end, I think the best teams will rise to the top. I got a text from a county basketball fan, that summed it up pretty nicely. He said that Hillsdale has the best balance, Northwesterm the best player (McKean), Orrville the best front-court (Wasson, Winters, Pirman) and Smithville the best guard play (Frizell & Bates). I think it's going to come down to coaching and matchups more than anything else. My pick to win it all. This is tough. I think it's Hillsdale's to lose, and to be different, I'd like to pick Northwestern, but they only beat a down Orrville team by 2 points and it took Brennan McKean scoring 48 points for it to happen. I think Orrville has a shot, but Hillsdale made them look pretty bad at the Smitty Classic back in December. Norwayne get up for big games, but can they get past the average teams to get there? And what about Smithville? They had two close losses to Northwestern and Hillsdale each. Not really a bad loss on their schedule. See what I mean? It's all going to be about who matches up the best and what team is playing the best on any given night. Ok, my pick is the powerhouse team from Smith-Orr-West-Hills-burg. Seriously....I'm going to go with Northwestern. I think they have the best player, and the best clutch team in the tournament. Their foul shooting as a team is a huge advantage, and McKean is this year's version of Jake Bolyard in terms of a player who can single-handedly change the outcome of the game. Mark Alberts is no slouch of a coach either. He knows how to win the close games. If Andrew hadn't picked Hillsdale, I probably would've went with them....but we picked the same teams last year and that was boring. On to the picks.....Andrew and I didn't compare notes, so any coincidences in score are just that. Tim's Pick: Loudonville has trouble scoring points. That's a problem. Columbia has been on a mini roll late in the season. I like the Raiders to advance. Columbia 59 - Loudonville 53. Andrew's Pick: Triway and Waynedale scrimmaged in the preseason in The Pit, and Waynedale only lost by 5 points. However, during the season their only wins came against Kingsway Chrisitan, Central Christian, and Chippewa. Ouch! Triway, on the other hand, has beaten Wooster and Northwestern and taken a few other good teams to the wire. The Golden Bears and Titans have a long history of playing each other, but it’s been quite lopsided with Triway winning the last 16 or so (something around there). That may be one of the reasons this season was the first in a long time that these two did not meet in the regular season. At least we differed on two picks. More than you could say for last year's tournament. Check back on Thursday March 4th for results from round 1 and predictions for the sectional championship round. Good luck to all 14 teams.